What I found on the terrace was a star studded cast of culinary characters. Besides Marc. Nikki and myself, our group of six included the one and only Pim of Chez Pim fame (Pim's like Pele, she only needs one name,) Mikael Jonnson of Gastroville, and David Kinch, the highly acclaimed chef of restaurant Manresa in Los Gatos, California. As we were the last to arrive at the restaurant, everyone was already on the terrace playing. As soon as I opened the terrace door, they included me in the fun and I was handed a chunk of four year old Comte from Bernard Antony as a pre-dinner treat. Most three star restaurants are located in tradtionally styled buildings, possibly with a modern element like a huge plate glass window attached to the dining room, But the setting and physical plant at Bras are so magnificent and unusual that they deserve their own set of photos. 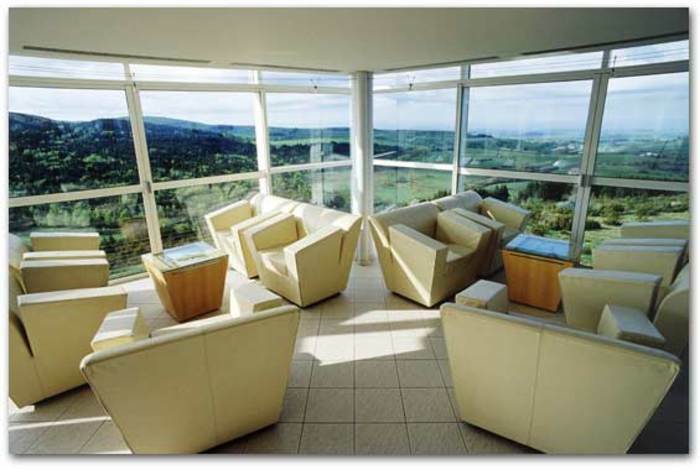 The hotel is designed in an ultra-modern style and is set upon a hill overlooking the Auvernyat countryside. One of the nice things about going to Bras is having drinks in the lounge that hangs out over the edge of the building (pictured above and below.) There you will be presented with the menus, the wine list, and a series of amuse will be served. “This is possibly the single greatest vegetable dish concocted by man. And it doesn't really look like much at first. But after a few forks you realize that you are eating something substantial. This realization came upon all of us at the table at almost the same time and I asked aloud to the others, how many vegetables do you think are in this dish? After a bit of debate I called the hostess over to ask her and she told us between 30 and 40, each cooked in their own pot of water prior to the dish being assembled. In addition to the melange of vegetables there are three or four different vegetable purees painted onto each dish to flavor a forkful of vegetables. The brilliance of this dish lies in the multiple textures and how the flavors release in each mouthful. There is so much texture, so much volume, that it gives the impression of eating protein." Turbot was next. Of good quality; I was served a delicious hunk with a slice of jambon d'Auvergne alongside. A very nice dish but not quite at the same level as the vegetables. Unfortunately, one portion of the turbot served at our table was severely undercooked and that caused a bit of a scene. The diner, who will remain namesless, opted against sending it back to be cooked properly. Rather they spent the entire course criticizing the restaurant for the error. Later on when asked why this course of action was taken rather than allowing the restautant to correct their error, the response was that it would have been disruptive to the rest of the table to send the fish back. Of course someone else pointed out that by not sending it back, and by making it a central point of discussion including spearing the fish with a fork and holding it up for all to see, was probably more disruptive than sending it back would have been. But c'est la vie. Everyone is entitled to make the dining experience be about what tunrs them on. But my focus tends to be on trying to get things to work out well, and not trying to stop the train dead in its tracks to make a point. Anyway, then they brought Foie gras. On my last visit the Foie gras dish was the single greatest foie dish I've ever had. The quality of the liver was superb, and it was the firmer than any piece of foie I had ever seen. I was literally able to cut paper thin slices of it, that's how firm it was. But this time it was a little mushy. It wasn’t bad tasting but at best a two, not three star dish. Then lamb sweetbreads that were sauteed with dried nuts. This was a dish that we added to the tasting menu but it turned out to downright ordinary, extemely dry and it severely lacking in salt. Grilled Asparagus which were superb. I can't remember the type but they seemed halfway between green and white. Firm and delicious with great flavor. Then what I thought was the dish of the meal. A poached and then fried Galloise Blanche Chicken served with aligot. Amazing and probably the best quality chicken that I've had. Moist without being watery, and beautifully firm with every bite packed with flavor. The aligot was ten times better than on my last visit. When you put it in your mouth it was the consistancy of wet candle wax that had just fallen, but slightly grainy and it would immediately begin to disintegrate on your tongue. The combination of chicken with potatoes, cheese and garlic was sinfully good, and when I woke up the next morning it was haunting me. I know that everyone raves about Bernard Pacaud's roast chicken with truffle butter under the skin but in my book this blows it away. Desserts were a Trio of Green Sorbets (don't ask me to remember what flavors they were other than one was green apple I believe,) along with Roasted Bananas and Lychee Ice Cream, both very nice, and then Bras' famous signature dessert of molten chocolate cake which was terrific. The wine list was fabulous with literally dozens of well priced goodies. We drank, 1995 Coche -Dury Bourgogne, 1996 Niellon Chassagne-Montrachet Champgains, 1982 Trimbach Riesling Clos St. Hune, 1987 Henri Jayer Nuits-St.-George, 1993 Marquid D'Angerville Volnay Clos des Ducs The wines were phenomenol, let alone tremendous value for the money. It really bothers me when someone complains about a dish then does not send it back to be corrected. Especially when they tell the server something is wrong but decide to keep the dish anyway, it doesn't make sense. I don't suppose you managed to snag a recipe for that vegetable dish? It sounds absolutely amazing. I just stumbled across your wonderful site. I have the cookbook (do cookbooks get any more beautiful?) and it is interesting to read a review of the place, as the book makes me want to go there so badly. Isn't it a strange idea to call the Gargouillou "a dish?". It is more an idea of a dish, a picture of that day's market and mood. The only recipe is that each vegetable available that day, picked by the Ched in the 5am market, should be poached to perfection. Save herbs or seeds that don't cook. And also the few purees or sauces which, depending on the chef's judgement, are the best way on that particular day to express the vegetables or to emphasis the Gargouillou. There can be aioli (garlic mayonnaise) or tapenade (choped olives) as well. And indeed all the vegetables are, in the end, reheated and united in a pan with butter and ham. But what it really is an image of the market and of the Chef's mood that day. It is bitter in the spring, flowery in summer, sweet in the winter (the small part of it that the place is open-- actually more late fall and early spring). I agree, what I sow show me that your kitchen is definitely an explosion of flavor. I would like to taste some of your wonderful recipes. I'm a bit surprised that you didn't find Pim a blundering and pompous attention whore. Looks like a place where I can live for sure. Thanks for the picture.